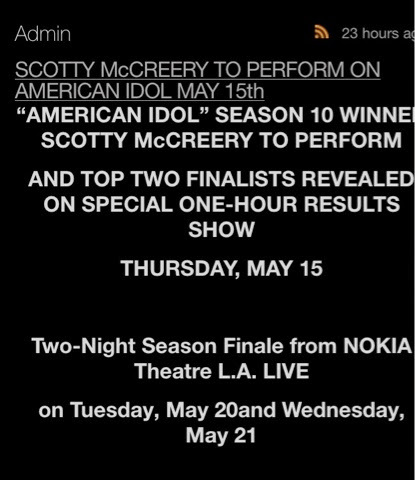 It has been announced on Scotty's official site he will return for the one hour Special to perform 'Feelin it' before the top 2 are revealed! This is GREAT news ! and I hope people start requesting it after they hear it. Go to the top of Donna's home page and where it says mediabase, click on it and find your radio station and request it also SYT.I just put my name and e-mail and code . Request everyday !!!! YES. It sure was so fantastic to see him back on Idol. They love our Scotty why would they invited him back. That was so cute of him to bend down so JennLopoz could kiss him on the check. I Crazy love him. I feel so bad for what happen to him. when those guys scare him. I hope they Catch all the guys & put their buts in jail 4-live. I was so Scare for our Scotty that I Cried.